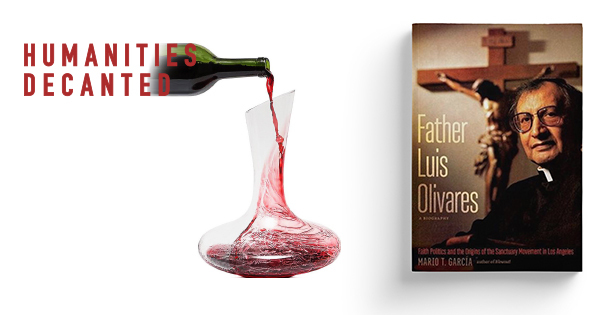 García‘s latest book is the untold story of the Los Angeles sanctuary movement’s champion, Father Luis Olivares (1934–1993), a Catholic priest and a charismatic, faith-driven leader for social justice. Beginning in 1980 and continuing for most of the decade, hundreds of thousands of Salvadoran and Guatemalan refugees made the hazardous journey to the United States, seeking asylum from political repression and violence in their home states. Instead of being welcomed by the “country of immigrants,” they were rebuffed by the Reagan administration, which supported the governments from which they fled. To counter this policy, a powerful sanctuary movement rose up to provide safe havens in churches and synagogues for thousands of Central American refugees. Based on previously unexplored archives and over ninety oral histories, García‘s biography of Olivares traces the life of a complex and constantly evolving individual. Mario T. García is Professor of Chicana and Chicano Studies and History and author of The Latino Generation: Voices of the New America. Sponsored by the IHC’s Harry Girvetz Memorial Endowment and the Department of Chicana and Chicano Studies.